Michigan State hosted Ohio State this weekend and after topping the Buckeyes Friday night, OSU scored with 67 seconds left last night to salvage a split in the two-game series. Nick Sucharski and Derek Grant each scored once and assisted on two others as Michigan State defeated Ohio State, 5-2, on Friday night. Trevor Nill, Zach Golembiewski and Torey Krug also scored goals for the Spartans, while Drew Palmisano stopped 31 shots in goal. Saturday night, Palmisano made a season-best 43 saves, but a Patrick Schafer wraparound at 18:53 of the third period and a Sergio Somma empty-netter later gave OSU a 4-2 win. Sucharski and Dustin Gazley scored in the loss, which was the Spartans' first CCHA loss at home this season. 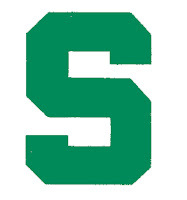 Michigan State (16-8-4, 11-5-4-1 CCHA) hosts Michigan Friday night before playing the Wolverines Saturday night at Joe Louis Arena in Detroit. MiCHO's Karl Henkel will be at The Joe Saturday night with a live blog, exclusive photos and a game recap.